"It's International Moke Day 2064! It's International Moke Day 2064!" "Okay, I heard you the first time!" it was about time I got the wall's attitude adjusted - it was way too aggressive. Funny. had led to several becoming, unsurprisingly, insane. Both wall and owner! morning reached professional proportions - almost! milo and told it I was going out. is nicer - what can I do? Moke Day today so I'm off to the Hanger for our Moke-owner Club celebrations. drone passing by in 15 minutes." "Please don't be silly, the Moke of course," I said with a sigh. always reappeared afterwards but I always looked over my shoulder to make sure. 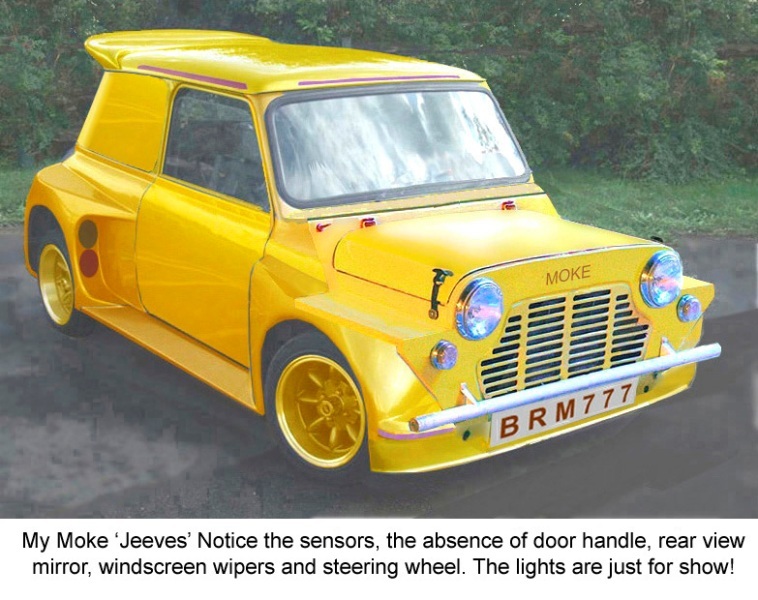 it that I realised all was not well - the Moke was a very unhappy soul indeed. want a gender change!" Yes, just like that - Crikey! "Jeeves, Dave, I'd like to be called Jeeves." was and he was one happy Moke at last. totally irresponsible to get behind the wheel even if there was one! now that I'm bobbin' on! Africa is still Chinese. Globalisation's only permanent favourite is cheap labour. pumped many a mile (kilometre) while being desalinated along the way. "Hi Dave, we're here at the Hanger." ideal for cars with hands-on drivers. 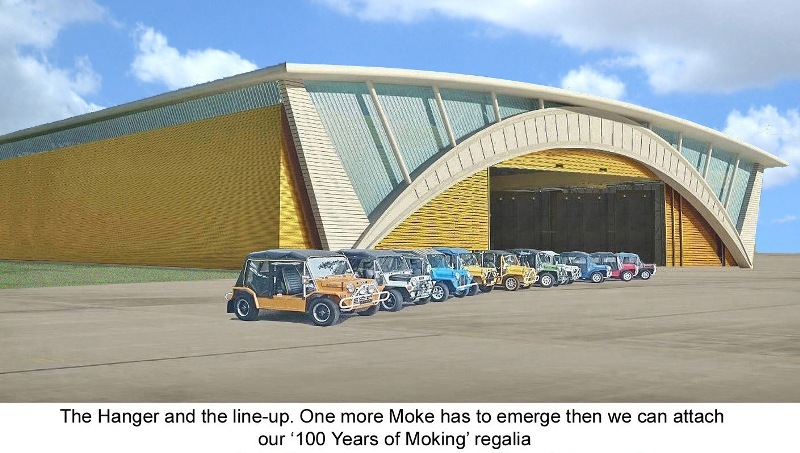 A small group of Moke enthusiasts were shuffling around outside the Hanger's door. could get more members to join our Club? "I tried the magic word," said Mark, "but no joy." the count of three ... Ready." "One ... two ... Three." "ABRACADABRA!" we shouted in unison. And the hanger said, "thanks," as the huge door slowly slid open. sight before us, our eyes completely oblivious to the many other vehicles inside. Paul was the leader today and we all followed him around the track as best we could. relic of the past. How many decades ago were those damn things done away with? stopped the leaders but let the tail-enders scramble through. The lights shouted "HEY! this - he always was a joker. this section we had learned to keep well away from the Moke in front! spare one had eluded him up to now. And I still shake my head in disbelief at what technology had accomplished so far. Colour 3D holograms can be produced from movie footage and even photographs. black and white wasn't a challenge! assembly of the prototype Mokes, and in 3D - amazing stuff! wondered. But then - Blackpool Tower came into the hologram - so a dead giveaway! "Roy Scott!" we all shouted. and we waited - and the Parsonage at Haworth appeared. "Mark Peacock," was our cry. "Doug or Scott Williams and Black Douglas". "Too easy - William in Singapore". And so on for an hour. 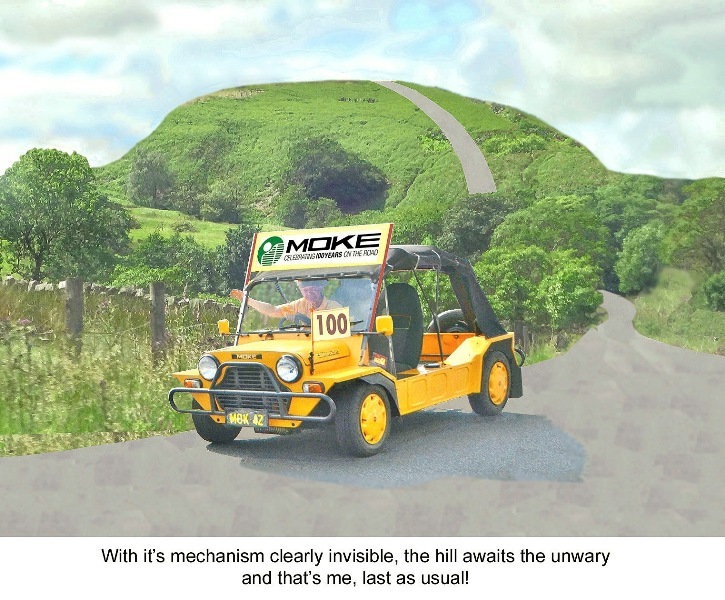 Our Moke history proving spot-on for every sequence! worst. Mike was lying on the floor on his back under the rear of his Moke! doing a temporary repair, by tying the pipe back up using his handkerchief. "About time too." bellowed the hanger as its huge door closed with a big bang! maybe an additional haphazard hill!